Faced with slipping schedules, NASA has delayed announcing where its space shuttles will touch down for display. NASAhas waved off revealing where its soon-to-be-retired space shuttles will bemaking their final landings for public exhibit. A combinations of events, including delayed launch datesand congressional acts that proposed adding at least one more mission to thetwo shuttle flights remaining, resulted in the space agency postponing itsselection ofmuseums where its winged orbiters will go on display once they are retired. AJuly announcement on the final homes for the shuttles had been anticipatedsince January of this year, when NASA made a last call for shuttle suitors. "Theyhaven't established a new date," NASA spokesman Mike Curie toldcollectSPACE.com. "Because of delays to the manifest, shifting STS-133 toNovember and STS-134 to February, the announcement was also delayed." Spaceshuttle Discovery, which has been promised to the Smithsonian since 2008, wasslated to fly its last flight, STS-133, in September but more time was requiredto prepare the storage module it will add to the International Space Station. 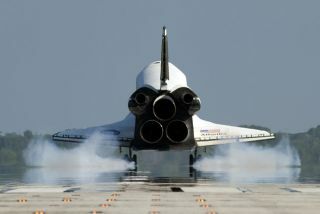 Endeavour,which together with shuttle Atlantis remains to be assigned to a museum, wasset to fly in the November time-frame that Discovery will now launch. Itsflight with the Alpha Magnetic Spectrometer, is nowtargeted for no earlier than February 2011. Forthe 21 organizations NASA says are in the running for an orbiter, the delay hasgiven rise to what appears to be a heightened sense of competition, with therate of press releases, public petitions and dedicated websites increasing andeven a groundbreaking for a facility to display a hopefully-awarded shuttle. Themuseums and NASA visitor centers have also turned to their states' congressmembers, adding an additional political component to the decision that thespace agency needs to now also take into consideration. "Thatwill have to sort itself out as well," saidCurie. Whenthe Senate Committee on Commerce, Science and Transportation released itsapproved text of the NASA Authorization Act of 2010 on July 15, the billincluded a section devoted to the "disposition of orbiter vehicles." Thebill, which was championed by senators from Florida and Texas, went beyonddirecting the NASA Administrator to decommissionthe shuttle fleet in a means consistent with other surplus governmentproperty. It also specifically gave "priority consideration" tomuseums located in areas sharing "an historical relationship with eitherthe launch, flight operations, or processing" of the orbiters. Thatprovision amounted to Florida and Texas trying to make an "end run"around NASA's competitive process, according to the National Aviation HeritageAlliance of Dayton, Ohio. The not-for-profit organization, which represents theNational Museum of the U.S. Air Force as well as other Ohio-area aviationsites, urged elected officials to change the text before the House ofRepresentatives could adopt similar language. Sowhen the House Committee on Science and Technology finalized the text of itscompanion bill on July 22, the wording had been amended. Though still makingmention of an historical relationship with the space shuttle orbiters, theHouse called for a competitive process "that takes into accountgeographical diversity." "Withthe help of the entire delegation it was possible to have the amendment passand ensure that a decision will be made that reflects the entire contributionsof the nation to the shuttle program and not just those of two states,"said John Bosch, chair of the National Aviation Heritage Alliance, in astatement. "We recognize this remains a very competitive process andthat's how it should be until a final decision is made by NASA." Evenwhen the decision is ultimately made, the chosen museums may still need to waitlonger to receive a shuttle due to a provision agreed upon in both the Houseand Senate bills. Both chambers called for an addition of a shuttle mission toNASA?s manifest to fly no earlier than June 2011. Thebills need to be voted on by the full Senate and House -- now not expecteduntil September -- before their differing texts can be worked out in conferenceand the act can be passed into law. Noteveryone is waiting on Congress. Museumsin Florida, Texas, Ohio and elsewhere are continuing to step up their publiccampaigns to bring a space shuttle to their facility. SpaceCenter Houston's "Bring the Shuttle Home" petition campaign, whichbegan in July, has to date nearly 15,000 signatures on letters and e-mailsurging President Obama to support displaying a retired orbiter at NASA'sJohnson Space Center in Texas. TheIntrepid Sea, Air and Museum in New York City has collected over 128,000signatures since March supporting landinga shuttle on -- or at least next to -- the modified aircraftcarrier-turned-museum. TheMuseum of Flight in Seattle, Washington launched a similar petition effortrecently but also traded their pens for shovels, breaking ground June 29 forthe construction of a new $12 million, 15,500-square-foot "Human SpaceFlight Gallery" designed to showcase a shuttle, if awarded. "TheShuttle is among the rarest of space artifacts," said interim museumpresident Michael Hallman in a statement released at the time of the ceremony. "The possibility of securing one is very exciting, and would be a tremendousopportunity for the state of Washington in terms of the economy, tourism andthe educational impact this could have on our community." Othermuseums competing for a retired shuttle include the Tulsa Air and Space Museumin Oklahoma; the Brazos Valley Museum of Natural History in Bryan, Texas; theEvergreen Aviation and Space Museum in McMinnville, Oregon; the CaliforniaScience Center in Los Angeles; and the Kennedy Space Center Visitor Complex inFlorida.